A series of fortunate events got this blog started. First there was intent: I wanted to write but successive ideas for book plots all fizzled out or went up cul-de-sacs. Second, there was a deliberately provocative and ill informed piece on the BBC website about lager-fuelled louts. Third, there was the growth of craft and cask beer and the correlating decline in the regard for lagered beer. Three pieces emerged from the initial Tinted pen on lager, which prompted, and still do, many comments and questions when I see people – some surprised about lager, others welcoming another voice to the side of ensuring a great style of beer doesn’t become demonised. Demonised perhaps, but not by most drinkers. And from what I can see, reports of the untimely death of lager have been greatly exaggerated. Yet equally, the momentum of creativity, ingenuity and desire to brew great lagers in the UK is thin. Standing back, looking at my own drinking choices, there’s a clear pattern – American Pale Ale and IPA predominate at home; English pale ales are the favourite out and about. In the Tinted Household, the hegemony of lager has passed and the move to the dark(er) side completed with unswerving ease. Until last Friday night. Oooh, I don’t know, I just had the taste for something clean, yet rewarding with my Friday night Pizza, and only a lagered beer would do. Besides, a couple of four packs of Pilsner Urquell and Budweiser Budvar were in near-cryogenic preparation in the downstairs beer fridge. Delay was futile. Broaching could not be resisted any longer. Early adopters of the Tinted musings may recall my first experience of Plzeň. At the border, the Czech border guards, in an act of post WWII solidarity, waved us past a fuming row of German drivers as we gunned the Bentley* through the crossing, nonchalantly waving our passports*. I shall refrain from repeating it, suffice it to say, Plzen was eye opening. Bear in mind the iron curtain had fallen only a year before – men, the spit of the good soldier Švejk, walked the streets. Rounded, head-scarfed women accompanied them. But the beer, by God – by rights, the original pilsner. Deep bronze, brooding, biting. Still, back then, conditioned in pitch-lined barrels. Since then: acquisition, turmoil, struggle. For struggle it has been: SAB have struggled to find its edge; struggled to comprehend why this beer of all beers, rarely gained traction in markets it was exported into. The bitterness? The name? The lack of marketing funds? Internal priorities? I like Pilsner Urquell though, and I think SAB are doing a good job – because, on most aspects of the brand, they’re not meddling too much. Don’t get me wrong – the beer has changed. It’s a little thinner than of old, a touch paler and noticeably less forthright in the aftertaste. But it’s still a cracking beer and behind it there seems to be a mindset of stewarding the brand, not fiddling – there seems to be some respect. The bottle is a design triumph and feels timeless; the glassware is the classiest in the SAB range, rightly so. The font looks authentic. The advertising is copy heavy and interesting (what little there is). And then last Friday, I rediscovered the fundamental reason behind why lagered beer dominates in the world, like a second whack on the side of the head. After almost two years of eschewing lager, I drank one after another. Not mindlessly, but willingly. The first was a delight – cutting through the palate, refreshing right across the taste range from foretaste to aftertaste. One wasn’t enough… I levered the crown off the second on autopilot before it too sunk without trace. I switched to Budvar and the same happened again, two more bottles of delightfully rewarding refreshment. Oh, I know. I won’t make the shortlist of the Market Research Society’s Award for Insight Excellence with this observation. And I’m not turning my back on the majesty of the Pale Ale Counter Reformation, for many of those beers combine the same enticing drinkability, flavour reward and refreshment. Yet, there was something about returning to the fold that conjured up what it must have been like in Bohemia and Bavaria in the 1840s and 1850s. Never having seen a beer that was as clear, radiant, golden and refreshing. No wonder it was embraced with such relish and rightly deserves its place in the beer pantheon – and your repertoire – of today. * some elements of this story were, and remain, fictitious, although the general thrust and plot is entirely factual. Honest, guv, ask my brother. And the real truth (not sounding defensive) is that I’m not a trainspotter. There is no child-inspired interest in jotting down engine numbers. I’m really not interested in the carriage configurations of Virgin Pendolinos*. But I am enthralled by the confidence, the grandeur, the sheer scale at which the Victorians thought. I am impressed when the aforementioned Virgin train goes barreling past at 125 mph, tilting wildly. But most of all, it’s the stations and their concourses. Whenever I travel through one of major cities I can’t help but look up in awe at the majesty of the engineering – both in the vision and the delivery. The soaring & swooping Cathedral-like roof of Paddington Station; the civil engineering marvel of Edinburgh Waverley; the majestic curve at York. And of course, pretty much anything to do with St Pancras, always sharpened by the fact that where I occasionally go for a coffee is located in the beer store built by my old company almost 200 years before. And then there’s Euston. One of the UK’s busiest stations. The London terminus of my daily commute, a designated critical European transport corridor and the most important route for freight on the whole British rail network. It should be like New York’s Grand Central, Chicago’s Grand Union or Gare du Nord in Paris. Alas, while once it was, today it’s a Le Corbusian temple to concrete, blockiness and functionality. 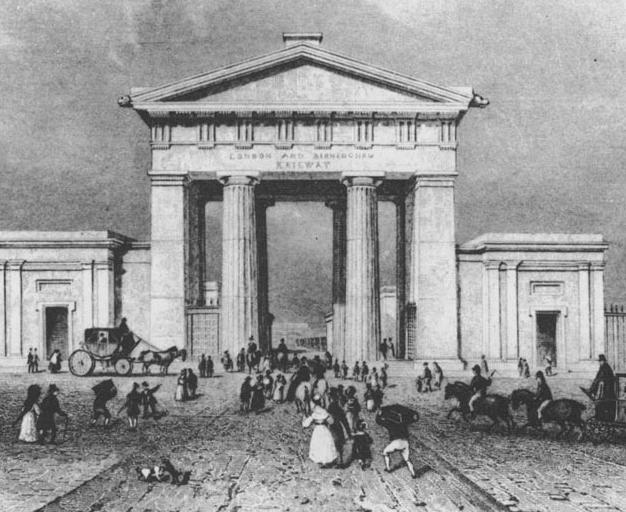 The real travesty being what stood there before – the Doric arch entrance being unceremoniously broken up and dumped. Imagine arriving here on the 7.46am from Tring. Yet, where the entrance once stood are two gatehouses. I have been skirting by them for about two years when an ex colleague suggested we meet for a beer before heading home – the venue: The Euston Tap. I almost blew my lid when I found out what I have been missing. Despite its heady architectural pedigree, the Tap isn’t much to look at. Just off the Euston Road, it’s so prominent it’s hidden to the eye, as most users of the ‘new’ station enter at either end, rather than through the middle where the old station entrance once was. In design, it’s Classical, but in classical terms it’s dumpy and lumpy, so the architecture doesn’t really rock you back on your heels. But the bar does. I didn’t count them, but there must have been a dozen draught beers, served through taps in the wall – a set up I have only seen once before, in San Francisco, but I’ll admit to living a sheltered life. Mostly, internal alarm bells ring when I see so many draught brands on sale, but here it was clear that they have the drinkers to justify it. Frustratingly in fact, both of my first two choices had run dry on the back of recommendations from the barstaff and the general volume of supping that had already commenced on an early Friday evening. Fortunately, the bottled selection was jaw dropping and gave me the opportunity to start a walk through The Kernel’s range of single hop IPAs, a voyage which once begun must be concluded. As for The Tap, that too is a voyage started. I will return and suggest you do too. 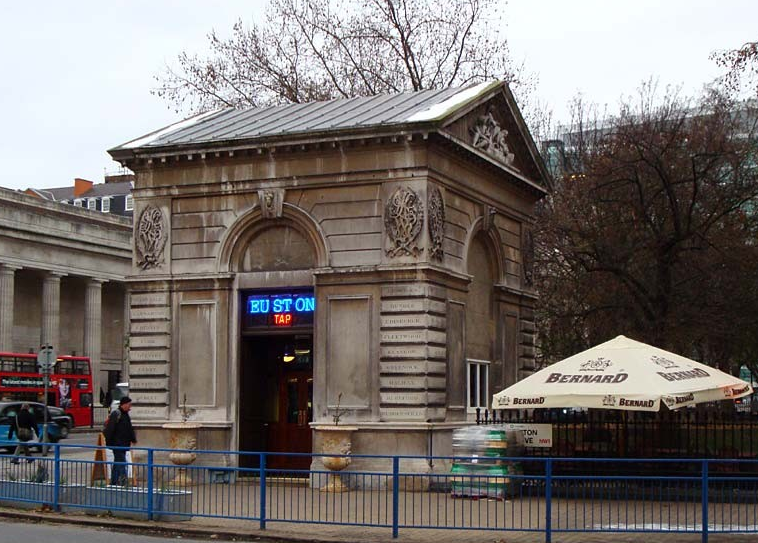 The Euston Tap, pub design courtesy of Inigo Jones.